Lee and Paul are completely self-funded but would like to thank and recommend the following businesses for their exceptional service. Horizons Unlimited has been a huge resource for planning and the actual impetus for the trip. We have attended their travel meetings in Queensland and Victoria where you get great encouragement, shared experiences and lots of advice on how to do it! 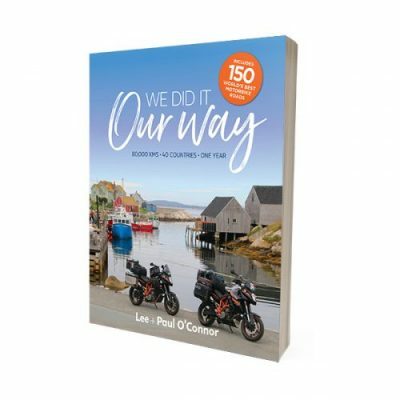 The DVD series is well worth watching and their forums connect travellers looking to share costs across certain countries, ideas on where to stay, carnets and paperwork, money saving ideas, what to pack, modifications to your bike – basically anything you can think of … ! From the Victoria meeting we have picked up Pete and Tili to join our adventure … thanks Grant and Susan – you are legends! See Luke for all your needs if you’re in Melbourne. These guys are super friendly and easy to deal with – and we feel would be there for us on the road if we needed parts shipped. They run a shop ride the first Saturday of every month and make newcomers very welcome. Contact Andy for some great accessories – all made and tested at their Frankston workshop in Melbourne. We have purchased the front soft panniers for Paul’s bike, Neck Warmers which convert to beanies (lined with merino), a Compressor Set, and PacMesh security nets – not to mention Andy’s signature straps. It’s hard drawing the line – good place to start if you are just starting to kit up. Lee's Forma Boots were purchased a week before departure from Brisbane and they started to leak at the seven month mark. On contacting Forma in the U.S. we had a replacement pair couriered to us within several days at no charge - so dry, warm feet again and a big thankyou to Forma!! (Love these boots - they are sooo comfortable and easy to walk in).